The first Paul Bietila Memorial Tournament was held at Suicide Hill on Washington’s birthday in 1953. Lloyd Severud took first place honors in that meet in the senior (now veteran) class. In Class AC competition, appropriately enough, Paul’s brother Ralph won first place honors with Rudy Maki, Ishpeming, topping the Class AC jumpers. That first meet came one week short of 14 years after Paul died. In that span, the feats and possibilities of that bright young athlete grew into legend, and that legend still grows. The legend is little more than truth, combined with what could have been for Paul, just under 21 years of age, was without doubt the best young ski jumper in America at the time of his death. 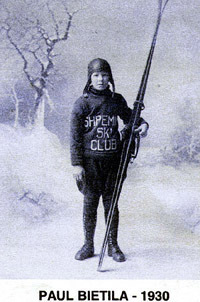 World War II lay just over the horizon; that would have been all that stood in the way of ski sport immorality for the fourth member of the Flying Bietilas. He was just 10 years old when he first jumped off Suicide Hill in 1928. At 15 he jumped 196 feet on the big slide for a boy’s world record. In the next years, he set and reset 14 distance records on midwestern hills. Paul was to be a member of the 1940 Olympic jumping squad, but those games were canceled when Russia and Finland went to war. Paul wouldn’t have made the games anyway. Competing in the Nationals on February 5, 1939, at St. Paul, Minn., he hit ice on a practice jump and skidded into a restraining post. A valiant fight for life ended February 26, 1939. In another practice jump on that fateful day, the 20-year old champion, a physical education student at the University of Wisconsin, had taken the longest jump of the day. And so the meet in his honor continues. 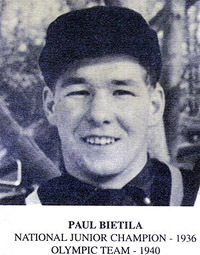 Through the years, honors in the Paul Bietila Memorial Tournament have gone to such names as John Balfanz, Jack Bietila, John Carello, Willie Erickson, Dave Hicks, Coy Hill, Don Hurst, Antti Hyvarienen, Kalevi Karkkinen, Yukio Kasaya, Gene Kotlarek, Jerry Martin, Esko Mommo, Billy Olson, Tom Petersen, Frydjof Prydz, Will Rasmussen, Nobukazo Saito, Jon St. Andre, Manfred Steiner, Greg Swor, Steve Sydow, and others. This year top ski jumpers will again gather at Suicide Bowl to match the jumping spirit of the man the tournament honors — Paul Bietila.